Out MSC Cruise started off rough with the scheduling and answers to pre-trip questions by MSC, but the trip was beyond expectations and would defiantly cruise on the MSC Seaside again. We chose MSC because of newer ship and pricing. When scheduling with MSC, there were a few issues which we were told was because of new computer system. Eventfully MSC fixed everything with scheduling cruise and extras. Embarkation day was nice as MSC had air conditioned area and fresh orange juice while waiting to board. Once on board we explored and checked out most of the ship while waiting on room to be readied and wow, the ship was really nice. 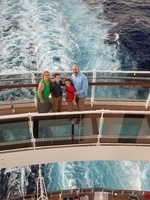 We were vacationing with our nine and twelve year old sons and were exited for what the week would bring. Our cabin was really nice, our bed was comfortable as well as the sofa bunks. The two buffets had really good selection of food that mad everyone happy. We had an early dinner time planned each night with each meal great and better than the last. Our wait staff were one of the best we have had on a cruise or elsewhere. My wife and our friends even friended our head waiter on Facebook..... After dinner every night we went straight to that night&apos;s show. We enjoyed each nights shows and even or two boys, our friends, and their girls enjoyed the shows. The pools and water slides were great for kids and adults with all the outdoor bar staff making great drinks. As for the ports, they were great locations to stop for a cruise (San Juan, St. Thomas, St. Marrten, and Nassau); however, the times and length of time at each port with the exception of St. Thomas were not the most optimal for times docked and length of time. As for excursions, we did not do any through MSC, but instead planed them ourselves. There was only one area of disappointment with MSC and that was they considered the ship tour to be an excursion and wanted to charge, I believe $62 per person compared to every cruise line we have been on did not charge for the ship tour. Our cruise was great and our family has already started planning next years cruise and we are most definitely going with MSC Seaside. Our cabin was well set up and linens kept changed out regularly. We did find areas that were not totally cleaned between cruises, but I know my standards are much higher than most. As a whole the room was nice and well maintained. Very short late night port of call just walked the downtown for couple ours with our group. We visited some spots we went to on past cruises to St. Maaten. St. Thomas was a great port and great length to and time at port. We took our on excursion to beach and snorkel.